Kiev Gestalt University’s Mission: We make the world better by educating professionals who help improve the quality of life of their clients by broadcasting humanistic values ​​and environmental attitudes towards themselves, other people and the world. Janae Weinhold and Inna Didkovska first met in Bratislava, Slovakia in 1995 during a two-week introductory training for psychotherapists. This training was jointly sponsored by the Colorado Institute for Conflict Resolution & Creative Leadership (CICRCL) and ROZRADA. Inna was part of a group of 15 young Ukrainian professionals who participated in this training. Inna worked as psychotherapist at ROZRADA for more than five years, then went on to Found and Direct Kiev Gestalt University (KGU), which now has 300+ students. KGY is one of the first private educational institutions in Eastern Europe to focus on Gestalt therapy. KGU is the only institution that has received accreditation from the European Association of Gestalt Therapy (EAGT) and the European Association of Psychotherapy (EAP). This means that our training program fully meets all the requirements for the duration and content of the curriculum, put forward by the EAGT and the EAP. Gestalt psychology, which is rooted in humanistic psychology and psychotherapy, is a school of thought that looks at the human mind and behavior as a whole. It has played a major role in the modern development of the study of human sensation and perception. 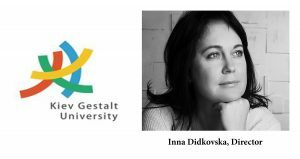 As Director of KGU, Inna Didkovska’s work has focused on integrating the Western principles and practices of traditional Gestalt psychology and psychotherapy into the more Eastern culture of Ukraine. She, her staff and students have integrated many components of Weinholds’ Developmental Model into their curriculum and psychotherapy practices. CICRCL and KGU have been collaborating since 2016, when Inna came to Colorado and she and Janae co-led their first seminar, The Search for the Divine Feminine. Since then, KGY has organized several seminars and public presentations in Kiev for Ukrainian psychotherapists that focused on parts of our Developmental Model. 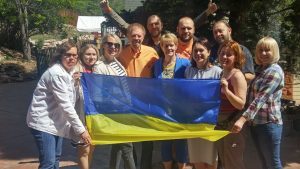 In May of 2018, CICRCL invited a delegation of 8 young Ukrainians to Colorado Springs for a 2-week visit. During their stay, they participated in a 10-day Manitou Chooses Love event, and also in two 3-day We Choose Love weekend events. CICRCL collaborated with the local Smokebrush Foundation, which paid for the Ukrainians airline tickets, food and housing. The shared experiences between Americans and Ukrainians were life-altering on both sides, generating amazing cross-cultural experiences. The feedback from the Ukrainians about their experiences was so filled with gratitude that they nominated two couples who played pivotal parts in their stay to receive CICRCL’s Servant Leader Awards. 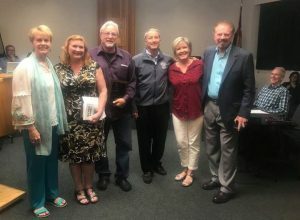 These awards were presented in August of 2018 at a meeting of the Manitou Springs City Council. Organize joint psychological and educational activities, such as courses, conferences, seminars, lectures & symposia. Exchange staff, students and/or faculty. Exchange of materials, including books, pamphlets, training materials, and multimedia resources. CICRCL plans to sponsor international and cross-cultural work with individual Ukrainians and Ukrainian NGO’s and organizations in the years ahead. This particular aspect of CICRCL’s mission has fulfilled our personal desires to transform catastrophe’s into opportunities for growth, friendship, and creating mutual experiences of LOVEvolution.